Layer diced pears, pineapple, banana, strawberries and oranges into large glass bowl, or 6 medium sized glass parfaits. Spread cooked whipped cream mixture on top of fruit. Refrigerate overnight but omit bananas from recipe. Serve chilled. Drain pears, reserve 1-cup juice. In small bowl, mix 2 tablespoon of juice with 2 tablespoons of flour and beaten egg. Stir until smooth. In small saucepan, add remaining juice, flour, egg mixture. Whisk until smooth and thick, add butter, and stir to blend. Remove sauce from heat and let cool completely. Whip heavy cream with confectioners sugar; gently fold cooled sauce into whipped cream. Set aside. Cut 4 pear halves into vertical slices as a garnish for top of layered salad. Dice remaining halves into bite sized pieces. Reserve the following fruits for garnish, pear slices, strawberries, and kiwi. 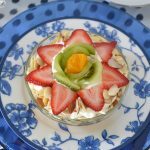 Layer diced pears, pineapple, banana, strawberries and oranges into large glass bowl, or 6 medium sized glass parfaits or bowls. Spread whipped cream mixture on top of fruit. Refrigerate overnight if desired. 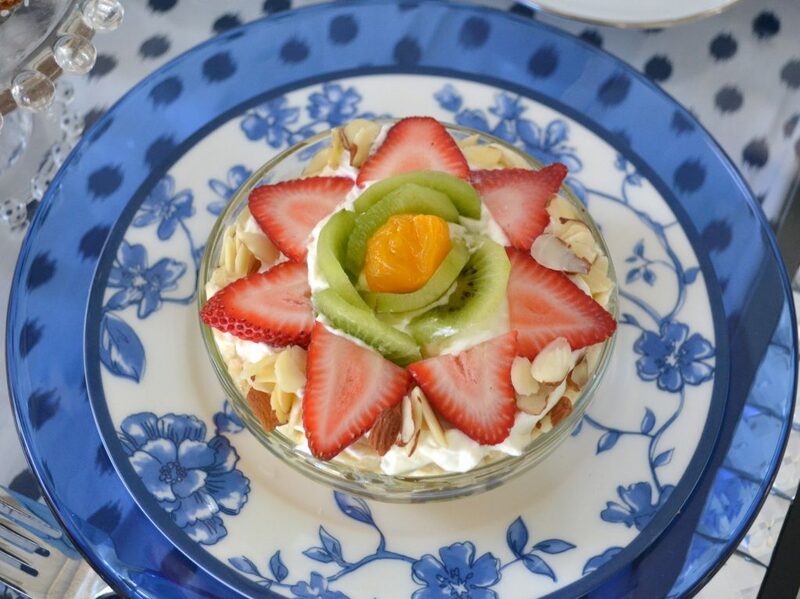 Just before serving, arrange reserved fruit and almonds in decorative pattern.